As a security engineer, I’ve been around the “physical security block” several times. But nothing prepared me for the question, “Have you ever seen problems with frogs in cameras before?” The Architect and Construction Manager were referring to a high security site in Louisiana that is adjacent to wetlandsso it gets wet. So wet in fact, it has an abundance of animal and amphibious lifeespecially frogs. PSE is providing consulting services for the construction of this new project designed by another security technician. Apparently, the local tree frogs didn’t see site camera poles as anything other than another tree to climb. Frogs have canals in their webbed feet that allow a slimy adhesive-like liquid to channel sticky tree climbing aids, or in this case CCTV pole climbing aids, to get to the cameras. The frogs were climbing the poles and found their way inside the cameras. As this frog is a “keystone” to the animal population, or critical to both land and sea environmental balance, it needs to hide. Once inside the supposedly sealed enclosures, they were blocking the camera views until they eventually dried up and died inside the camera domes. To make matters worse, their urine was also causing corrosion on the camera electronics. We needed to find exactly what kind of access into the camera enclosures was possible, and a way to solve the problemfast! The first thing investigated was the manufacturer’s information on the enclosure rating of the cameras. An Intrusion Protection (IP) rating is given to enclosures of electrical equipment based on certain criteria of ingress of solid objects/material, and ingress of water. These ratings are typically published by manufacturers for the different types of equipment enclosures they produce. The rating criteria is based on the European International Electrotechnical Commission (IEC) standard, which is also adopted by American National Standards Institute (ANSI) as ANSI/IEC 60529 entitled, Degrees of Protection Provided by Enclosures (IP Code). The first digit of an IP rating defines the level of protection against solid material, and ranges from a minimum of 0 (non-protected) to a maximum of 6 (dust-tight). The second digit of an IP rating defines the level of protection against liquids, and ranges from a minimum of 0 (non-protected) to 8 (protected against submersion). Each level has specific testing criteria that enclosures must physically be tested against to earn a coveted IP rating. In the case of camera enclosures, manufacturers typically offer exterior camera enclosures that are certified as either IP66- or IP67-rated. IP66 is defined as dust-tight and protected against powerful water jets from any direction. 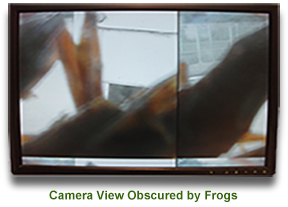 IP67 is defined as dust-tight and protected against immersion in water up to 1 m. IP67-rated camera enclosures are typically pressurized with an inert gas which completely seals the enclosure (including frogs!). But these models come with significantly increased cost and maintenance. The camera enclosures that were specified and used at the site were rated as IP66. American Tree Frogs are small, but they can grow to be up to 6 cm (2.5 in.) long. The problem is nature’s rapid and decisive manner in which procreation of this species occurs. Each female produces up to an average of 400 eggs meaning that even if 50% survive, there are still 200 small, growing, energetic baby frogs trying to hide. So, if the camera was supposed to be protected from dust and water, how were the frogs getting inside? And why couldn’t they get out? The camera enclosure featured a ventilation fan to prevent humidity build‑up in the dome, which meant that the very tiniest of ventilation openings were required. Frogs have flexible bodies and can squeeze through very small openings, being able to push through air filters, turn corners, and do things that air and water cannot do. Unfortunately, just as slowly heated (to boiling) water kills frogs, so do camera enclosures that were once cool in the night air, become the frog’s sarcophagus in the hot day’s sun. The solution was protecting these ventilation openings. Jason Delp, EIT, Projects Director, is a Partner at the consulting, design, and engineering firm of PSE. When he isn’t being an amateur zoologist, he concentrates on project management for advanced systems in security, communications, audio/visual, integrated technology, and fire protection systems for clients such as local, state, and federal government agencies and leading architectural firms across the nation.